Quick Summary : Peet's Coffee & Tea is an excellent source to pick up fine and affordable quality teas, sold in both loose-leaf and bagged form. Of course, Peet's Coffee & Tea also sells coffee and a myriad of other products, too. The pricing at Peet's Coffee & Tea is excellent. In particular, they have great prices on their samplers, with many sampler packs coming in at about $2.50 for each tea sample. This pricing is much less than many other online tea stores. For non-samplers, prices range from $2 to $5 an ounce for larger orders of specific teas. Peet's Coffee & Tea has a surprisingly large selection of teas. Truthfully, I wasn't expecting them to sell such a variety of black, white, green and herbal teas. As such, I ended up buying many more tea samplers than expected! While their selection isn't comparable in size to Adagio Teas, few people will be disappointed in their selection, either. The quality of the leaves from Peet's Coffee & Tea is excellent. While I don't like every tea I try, it's not the quality of the leaves that is at fault. It's just that I don't like the taste! Their tea samplers come packaged in nice, recloseable bags that keep light out and are air-tight, too - insuring the tea remains fresh. Peet's Coffee & Tea's website looks quite nice, but compared to other tea merchants I did find a few things I didn't like about it. First, the photos of the teas they sell are, to be charitable, "so-so." In no way do their photos compare to what is found on, say, the Adagio Teas website. Additionally, Peet's website is definitely not "touch friendly", at least at the date of this writing. I tried to navigate their site on my iPad initially, but found the text and spacing just a bit too tight to easily order from. Finally, one confusing thing is that at the time of this writing, their Rooibos Teas are listed in the Herbals Tea section. Anyone who knows anything about tea knows that rooibos teas are NOT the same thing as herbal teas. Thus, if you want to try out some of their rooibos teas, you'll need to look under the herbal tea section. Why Peet's doesn't have a dedicated page just for the rooibos teas they sell, well, I don't know! I've only ordered once from Peet's once at the date of this writing (December 2012), but I have no complaints. Immediately after I placed my order I received a recipt via email. All items I ordered were shipped very quickly and arrived in good order. As I didn't have any issues with my order, I didn't utilize their customer care in any other fashion. Orders from Peet's Coffee & Tea generally ship within 1-2 business days after the order. My own order shipped in 2 business days and I received email notification that the order had been shipped. Free shipping is also offered on all order of $40 or more, at least at the time of this writing. I suspect, however, the dollar amount to qualify for free shipping probably changes depending on the types of promotions they run. 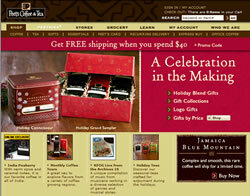 Peet's Coffee & Tea is a great place to order tea from. Their inexpensive samplers makes them a perfect place to "experiment with teas." While the web site has a few undesireable user features and odd categorization problems, overall I give Peet's Coffee & Tea a 5 Star Rating.